MarineNews March 2014 Volume 25 Number 3 BY THE NUMBERS 8 Passenger Vessel Safety Record INSIGHTS 12 Ben Billings President and CEO, Offshore Marine Service Association FINANCE 18 Beating the Bye-Bye Bonus Blues A changing tax landscape doesn’t have to mean bad news – at least not just yet. By Richard J. Paine, Sr. SHORTSEA SHIPPING 26 Real Marine Highways The Columbia/Snake River System defi nes shortsea shipping, and promises much, much more. By Sarah McCoy FLEET OPTIMIZATION 30 Shelter from the Financial Storm Vessel operators seek protection by hedging fuel needs. It’s easier than you might think. By Susan Buchanan PROPULSION 40 Repowering With a Purpose Belgium Diesel Engine Manufacturer Provides Main Engine for Alaska Fishing Vessel. BOATBUILDING 44 Short Seas in the Long Run Building for the possibility of shortsea shipping involves many variables. 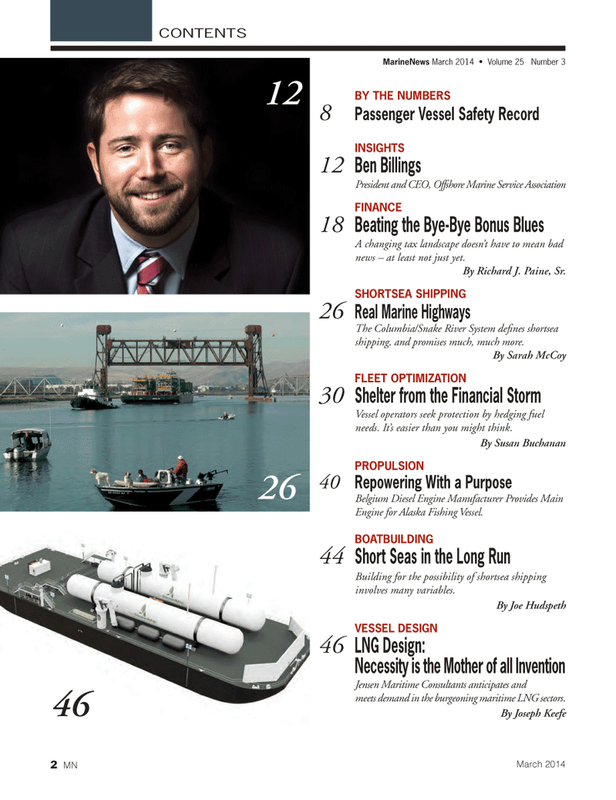 By Joe Hudspeth VESSEL DESIGN 46 LNG Design: Necessity is the Mother of all Invention Jensen Maritime Consultants anticipates and meets demand in the burgeoning maritime LNG sectors.